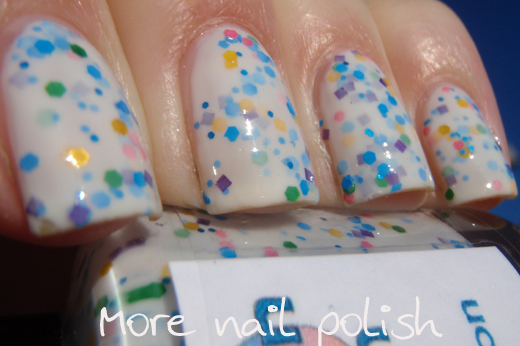 I have another Smitten Polish for you today. This is Confection, which has different sized and shaped glitter in blue, green, pink, purple and yellow - although my bottle definitely has a predominant blue feel to it. 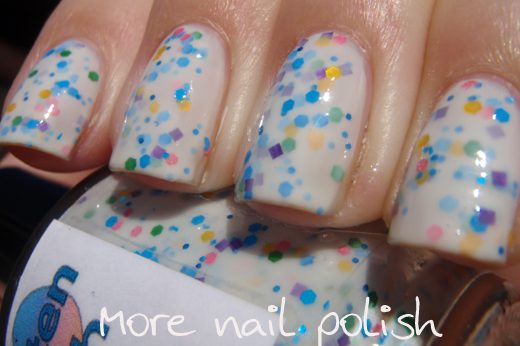 The glitters are suspended in a milky white base and I'm showing three coats on its own in these photos. For a white polish this applied really well and I had no issues at all with application. It also dried relatively smoothly and I only put on one coat of Seche Vite quick dry to finish it off. 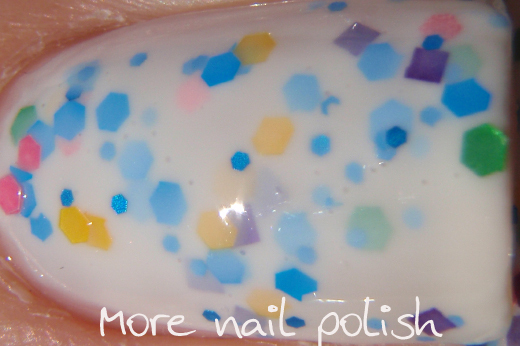 It's amazing how two polishes that are basically milk white bases with multi-coloured glitter can look completely different. The other polish I'm talking about is Gloss n Sparkles Unicorn Droppings. I never thought I would need two milky whites with glitters, but the two polishes are so different and I love them both. 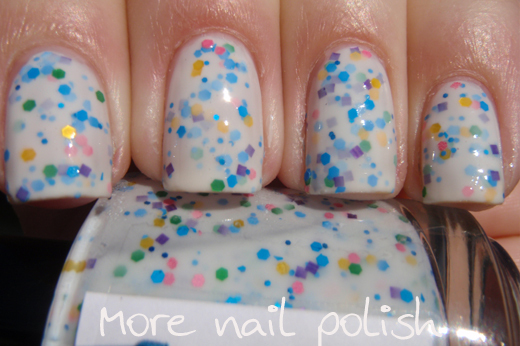 Smitten Polishes are available on her Etsy site, and will soon be available from Llarowe. There's a blog stealing and copying your posts verbatim. 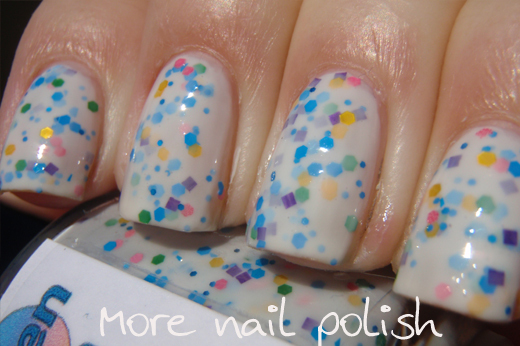 It's called nailscolor365.blogspot.com.au. I just saw on scrangie someone posted that they were stealing her posts, I went to it and the first two posts are YOURS!!! So bright and fun! I love this! I love this! It's so pretty, but really cute and fun at the same time. 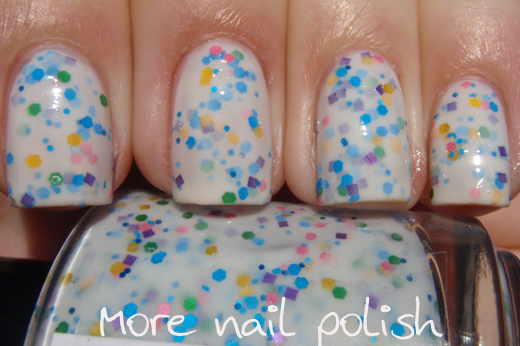 I really like these milky confetti looking polishes - I think it's one of the rare ways I might be able to wear a pale yellow base and pale blue base that always look horrible on me. The 1st one I recall really making an impression on me was I think one called Hippy Hop...not as much a fan of these done in pinks despite I like pink polish - but maybe it's cause I can wear pinks and cannot pull off whites/yellows/light blues without something, something in or on top of them. I need to pop for one of these milky whites but might try to do one of my own first. I enjoy the shapes and sizes of glitter in this one. I appreciate that the milky base doesn't hide the glitter.